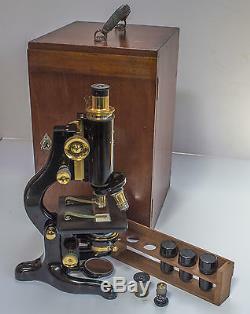 This is a vintage/antique WATSON "Service" microscope which was made by W. London, with product serial number 53840. The microscope is in good working order both mechanically and optically, and it is highly collectable. 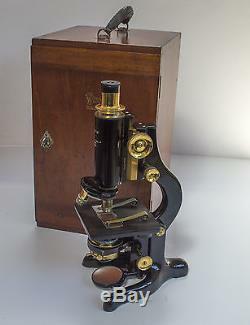 This is a fine example of the early version of the "Service" microscope which was only introduced in 1919. 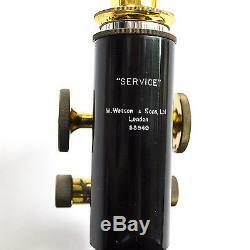 Watson "Service" (Serial number: 53840). 1/6" para, 2/3" para & 1/12 para oil imm (all with bakelite containers). Eyepieces: two eyepieces included, marked with x6 and x10. Dual focus system: Rack & pinion main focus wheels, and fine focus knobs. Slide clips above the square stage. Sub-stage with an "Abbe" type condenser, lever operated iris diaphragm and swing out filter holder (a blue colour filter included). Rotatable plano-concave and height adjustable mirror. Or 7.5kg/16.5 lb. Comes in a solid mahogany case with brass hinges and leather handle. Case dimensions: 225mm(W)x365mm(H)x250mm(D). There is an original screw to hold the microscope in the case. Please see photos for further details. 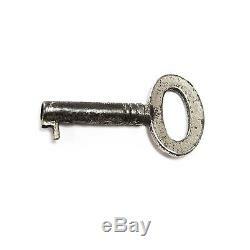 Note: the key of the case is partially broken, as shown in one of the pictures. The item "Antique WATSON Service Microscope by W.
1919" is in sale since Wednesday, July 12, 2017. This item is in the category "Collectables\Scientific Collectables\Scientific Instruments\Microscopes". The seller is "sunny5858" and is located in N. This item can be shipped to United Kingdom.